This reaction caused a new conflict, for Teresa loved her father devotedly. Feeling that delay might weaken her resolve, she went secretly to the Carmelite convent of the Incarnation outside the town of Avila, where her dear friend Sister Jane Suarez was living, and applied for admission. Of this painful step, she wrote: "I remember . . . while I was going out of my father's house—the sharpness of sense will not be greater, I believe, in the very instant of agony of my death, than it was then. It seemed as if all the bones in my body were wrenched asunder.... There was no such love of God in me then as was able to quench the love I felt for my father and my friends." A year later Teresa made her profession, but when there was a recurrence of her illness, Don Alfonso had her removed from the convent, as the rule of enclosure was not then in effect. After a period of intense suffering, during which, on one occasion, at least, her life was despaired of, she gradually began to improve. She was helped by certain prayers she had begun to use. Her devout Uncle Peter had given her a little book called the , by Father Francis de Osuna, which dealt with "prayers of recollection and quiet." Taking this book as her guide, she began to concentrate on mental prayer, and progressed towards the "prayer of quiet," with the soul resting in divine contemplation, all earthly things forgotten. Occasionally, for brief moments, she attained the "prayer of union," in which all the powers of the soul are absorbed in God. She persuaded her father to apply himself to this form of prayer. After three years Teresa went back to the convent. Her intelligence, warmth, and charm made her a favorite, and she found pleasure in being with people. It was the custom in Spain in those days for the young nuns to receive their acquaintances in the convent parlor, and Teresa spent much time there, chatting with friends. She was attracted to one of the visitors whose company was disturbing to her, although she told herself that there could be no question of sin, since she was only doing what so many others, better than she, were doing. During this relaxed period, she gave up her habit of mental prayer, using as a pretext the poor state of her health. "This excuse of bodily weakness," she wrote afterwards, "was not a sufficient reason why I should abandon so good a thing, which required no physical strength, but only love and habit. In the midst of sickness the best prayer may be offered, and it is a mistake to think it can only be offered in solitude." She returned to the practice of mental prayer and never again abandoned it, although she had not yet the courage to follow God completely, or to stop wasting her time and talents. But during these years of apparent wavering, her spirit was being forged. When depressed by her own unworthiness, she turned to those two great penitents, St. Mary Magdalen and St. Augustine, and through them came experiences that helped to steady her will. One was the reading of St. Augustine's ; another was an overpowering impulse to penitence before a picture of the suffering Lord, in which, she writes, "I felt Mary Magdalen come to my assistance.... From that day I have gone on improving in my spiritual life." Another Jesuit, Father Balthasar Alvarez, who now became her director, pointed out certain traits that were incompatible with perfect grace. He told her that she would do well to beg God to direct her to what was most pleasing to Him, and to recite daily the hymn of St. Gregory the Great, "!" One day, as she repeated the stanzas, she was seized with a rapture in which she heard the words, "I will not have you hold conversation with men, but with angels." For three years, while Father Balthasar was her director, she suffered from the disapproval of those around her; and for two years, from extreme desolation of soul. She was censured for her austerities and ridiculed as a victim of delusion or a hypocrite. A confessor to whom she went during Father Balthasar's absence said that her very prayer was an illusion, and commanded her, when she saw any vision, to make the sign of the cross and repel it as if it were an evil spirit. But Teresa tells us that the visions now brought with them their own evidence of ,authenticity, so that it was impossible to doubt they were from God. Nevertheless, she obeyed this order of her confessor. Pope Gregory XV, in his bull of canonization, commends her obedience in these words: "She was wont to say that she might be deceived in discerning visions and revelations, but could not be in obeying superiors." Teresa's longing to die that she might be united with God was tempered by her desire to suffer for Him on earth. The account which the gives of her revelations is marked by sincerity, genuine simplicity of style, and scrupulous precision. An unlettered woman, she wrote in the Castilian vernacular, setting down her experiences reluctantly, out of obedience to her confessor, and submitting everything to his judgment and that of the Church, merely complaining that the task kept her from spinning. 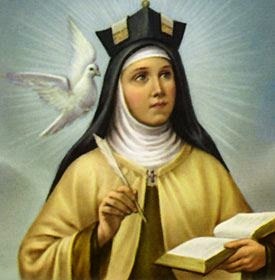 Teresa wrote of herself without self-love or pride. Towards her persecutors she was respectful, representing them as honest servants of God. Teresa's other literary works came later, during the fifteen years when she was actively engaged in founding new convents of reformed Carmelite nuns. They are proof of her industry and her power of memory, as well as of a real talent for expression. she composed for the special guidance of her nuns, and the for their further edification. was perhaps meant for all Catholics; in it she writes with authority on the spiritual life. One admiring critic says: "She lays bare in her writings the most impenetrable secrets of true wisdom in what we call mystical theology, of which God has given the key to a small number of his favored servants. This thought may somewhat lessen our surprise that an unlearned woman should have expounded what the greatest doctors never attained, for God employs in His works what instruments He wills." In the autumn of 1582, Teresa, although ill, set out for Alva de Tormez, where an old friend was expecting a visit from her. Her companion of later years, Anne-of-St. Bartholomew, describes the journey. Teresa grew worse on the road, along which there were few habitations. They could get no food save figs, and when they arrived at the convent, Teresa went to bed in a state of exhaustion. She never recovered, and three days later, she remarked to Anne, "At last, my daughter, I have reached the house of death," a reference to her book, . Extreme Unction was administered by Father Antony de Heredia, a friar of the Reform, and when he asked her where she wished to be buried. she plaintively replied, "Will they deny me a little ground for my body here?" She sat up as she received the Sacrament, exclaiming, "O my Lord, now is the time that we shall see each other! " and died in Anne's arms. It was the evening of October 4. The next day, as it happened, the Gregorian calendar came into use. The readjustment made it necessary to drop ten days, so that October 5 was counted as October 15, and this latter date became Teresa's feast day. She was buried at Alva; three years later, following the decree of a. provincial chapter of Reformed Carmelites, the body was secretly removed to Avila. The next year the Duke of Alva procured an order from Rome to return it to Alva de Tormez, and there it has remained.